Endodontics is the branch of dental care that deals with diseases of the tooth’s pulp. The pulp is found in the center of the tooth, inside the root of each tooth. The pulp is made up of connective tissue, nerves and blood vessels. The pulp is responsible for nourishing the tooth until it emerges through the gum. Once the tooth is mature, the pulp can be removed without destroying the tooth. That’s because each tooth also is nourished by a blood supply in the gums. Removal of the pulp is called endodontic treatment, but it is most commonly referred to as a root canal or root canal therapy. People call the act of removing the pulp as “having a root canal.” Root canal treatments are quite common with almost 24 million root canals performed each year in the United States each year alone. Root canal therapy is needed for two main reasons. The first is an infection. An untreated cavity is a common cause of pulp infection. The decay ruins the enamel and dentin of the tooth until finally, it reaches the pulp. At that point, bacteria will infect the pulp. Antibiotics can’t get to infections on the inside of your teeth. The inflammation caused by the infection decreases the blood supply to the tooth. The reduced blood supply also keeps the pulp from recovering. The second reason for a root canal is damage to the pulp which cannot be repaired. A fracture in a tooth can damage the pulp. So can a less severe blow or trauma to the tooth, even if there’s no visible damage. Multiple fillings or other restorations on the same tooth may also damage the pulp. Sometimes, even common dental procedures can hurt the pulp, although this is rare. An example would be if a tooth is cut too close to the pulp whilst it is being readied for a crown. Subsequently, the tooth might need a root canal. When the pulp is inflamed though not infected, it may heal on its own. Your dentist may want to see whether this will happen before doing root canal therapy. In the event that the pulp remains inflamed, it can be painful and may even result in infection. An infection in the pulp can impact the bone around the tooth. This can cause an abscess to form. 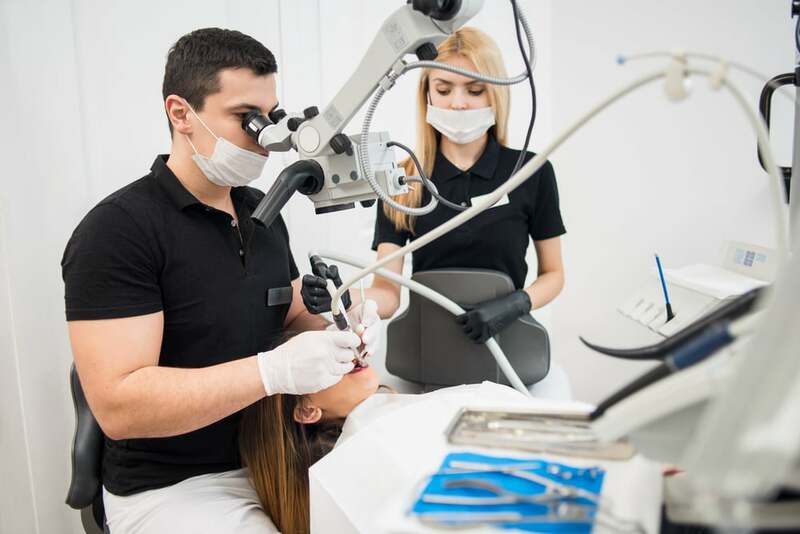 The goal of root canal treatment is to save the tooth by the removal of the infected or damaged pulp, treating any infection, and filling the empty root canals with a material called gutta percha. If root canal treatment solutions are not done, an infected tooth may have to be removed. It is better to keep your natural teeth if you can. If a tooth is missing, adjacent teeth can drift out of line. Retaining your natural teeth also helps you to avoid other treatments, such as dental implants or dental bridges. Also, if you ignore an infected or damaged tooth the infection can spread to other parts of your body. Having root canal treatment on a tooth does not necessarily imply that your tooth must be extracted in a few years. Once a tooth is treated, and restored with a filling or crown, it often will last the remainder of your life. If you have an infection of the pulp, you might not feel any pain at initially. But if it is not treated, the infection will cause pain and swelling. In some instances, an abscess will form. 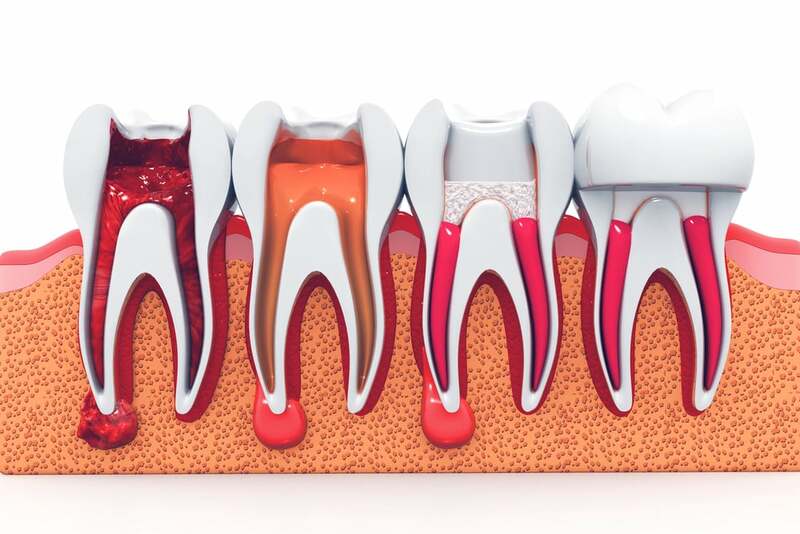 To determine whether your tooth needs root canal treatment, the dentist will often place hot or cold substances against the tooth. The reason is to discover whether it is more or less sensitive than a normal tooth. He will examine the tissues around the suspected tooth and gently tap on the tooth to test for any further symptoms. In addition, you will be given X-rays of a tooth along with the bone all around the tooth. The X-rays may possibly show a widening of the ligament that holds the tooth in place or a dark spot at the tip of the root. If either of these is found, your dentist probably will recommend a root canal procedure. Your dentist may need more information about the tooth. He may use an electric pulp tester tool. This device sends a small and painless electric current into the tooth. It will help your dentist determine if the pulp is alive. Again, this test does not cause pain or an electrical shock. You may feel a tingling sensation, but only when the tester is activated on the tooth. Overall, root canals get a bad rap. They are not as painful as the rumor is touted. With today’s modern techniques and technologies, performing a root canal is very tolerable.